Yesterday I gave a nice introduction to this eBook, Making 2015 Your Best Year Ever, created out of love and passion for personal finance education. It’s very simple, minimalistic design, less than 30 pages but filled with knowledge. What will you get out of this eBook?! Remember my Top 8 Most Important Lesson in Personal Finance?! EXPAND YOUR KNOWLEDGE. This could definitely be the answer. I compiled the most basic parts of personal finance applicable to any age, gender and status in life. 1. Learn to let go of your past and have a new and brighter outlook for tomorrow. 2. Know the importance of knowing your current financial status. Face the Truth even if it hurts. 6. Deal with Debt…Faithfully and Strategically!!! What do I ask for you in return? As this is a eBook (PDF File), I can only make it available to you via email so I will be needing your email address. If you follow me via RSS (from the link I gave above) you can also get daily updates once I publish something so I do hope you can follow me there actively. You can also be part of my Facebook, Twitter and Youtube subscriber. Search: Izza Glino or Izza Glino Full in your browser and ALL MY LINKS will show. 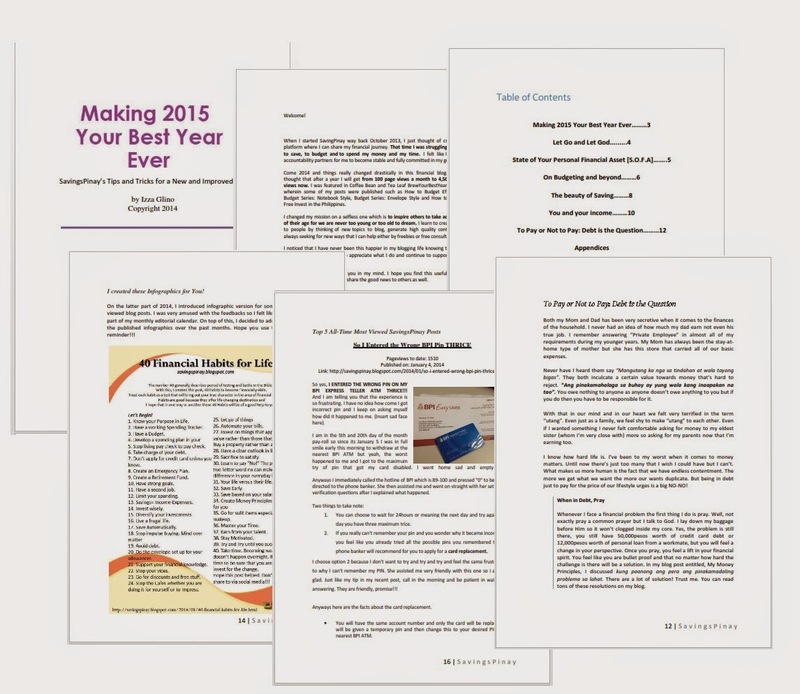 Hey, I also have a Make Your 2015 Your Best Year Templates!!! Now this is a big surprise. I actually created Templates that could help you to be productive and effective in life. Remember that time and money correlates to each other in a lot of ways so once you are able to manage your time, your finances will surely become better! Thank you for reading until the end. To those part of my Email List, expect the copy of the eBook in your inbox within today.